I want to take my kids maple sugaring this year so I researched places near Newton. Have you been maple sugaring? What is your favorite place? Please leave a comment. Native Americans were perhaps the first to discover that sap from maple trees could be processed into maple syrup. One popular oral legend is that a Native American chief hit a sugar maple tree with his tomahawk and the sap began to flow. The clear liquid that dripped from the split in the tree collected in a container on the ground. His wife used the liquid to cook venison and discovered that the meat and the sweet liquid that remained were delicious. Another theory: the Native people observed squirrels, sapsuckers, spring moths, and butterflies drinking from open wounds in trees. New England maple syrup is produced during a short four- to six-week sugar window typically from early February into April. Conditions are optimum when the temperature rises above freezing during the day and then drops below freezing at night. This fluctuation in air temperature is vital, causing pressure to develop in the tree, which allows the sap to flow. As the maple sap flows up from the roots of the tree during the day, the maple syrup producer, or “sugarmaker,” taps the tree. 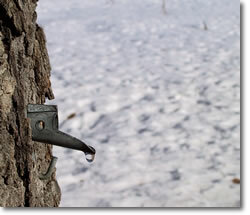 Tapping involves boring a hole into the tree and placing a spout inside the tap hole. The sap runs out of the tree and lands in a bucket connected to the spout. Does this process harm the tree? When guidelines are followed and only healthy trees are tapped, no damage to the trees results. It’s estimated that tapping removes only 10 percent of a tree’s sugar—an amount too small to harm a healthy tree under normal conditions. Traditional maple syrup buckets or a complex piping system can deliver up to hundreds of gallons of fresh sap to a large gathering tank. From the gathering tank, the sap flows into a sugarhouse through a filter to an evaporator, where it is boiled, removing water from the sap. As the sap continues to boil the liquid becomes sweeter, i.e. it’s sugaring content increases and changes to an amber color. Before the sap starts to evaporate, it has about 2 to 2 1/2 percent sugar content. (The sugar content in trees changes as the season progresses; sugar maple trees have the highest concentration of sugar). After the boiling process, the sugar content is about 66 percent. Next the maple syrup is put through another filter to remove “sugar sand,” which develops during the boiling and evaporation process. The maple syrup is then stored in stainless-steel drums for hot packaging into retail containers. North Hadley Sugar Shack: open Wednesday through Sunday from Feb. 17th – April 18th for their pancake breakfast and sugaring tours. South Face Farm, Ashfield, MA: Come visit us during maple sugaring season in March and early April. Our sugarhouse is always open for visitors, and on weekends our sugarhouse restaurant serves homemade pancakes, waffles, corn fritters, and many other special maple goodies. Try a stack of French Toast made with fresh homemade bread, topped with justmade maple syrup. Because maple sap flow depends on just the right weather conditions, you may want to call ahead and see if we are boiling when you plan to visit. Harwick Sugar Shack: Join us for an Open house at Hardwick Sugar Shack every Sunday in March from 11-4 pm. Follow the process of making maple syrup from tree to tasting. During the open house you can sample the finished product, visit the horses, see the old-fashioned way of making syrup and enjoy hot mulled maple cider. The whole family will enjoy this fascinating visit to a New England sugaring operation. We’ll share stories about the Native Americans’ role in the early history of sugaring, then continue by demonstrating colonial methods and tools for collecting and boiling. During a quick trip to our woods you’ll explore two different systems used today, and will have an opportunity to see new technology. Aspects of nature, science, meteorology, and math will be woven into the presentation. The tour heads to the sugarhouse, where a large evaporator stands ready to receive sap from collection tanks outside. Here, everyone will learn how sap is boiled into syrup, and see the equipment and gauges needed for this process. We’ll end back at the picnic table area for more stories and sampling. Boiling is weather dependent, so the tours are not based on our ability to boil. This is certainly a tradition that has something of interest for all ages! New this year! You may also choose to just come and walk around the farm on your own at no charge and without reservations. The Sweet Traditionsmovie will be playing throughout the day in the greenhouse, and you can poke around the tour areas when groups are not using them. $5 Admission for ages 4 and up. Some picture books to get the kids excited. Click on image to read reviews at Amazon. If you are thinking of DIY, these books might be helpful! And a maple sugar memoir with instructions! Once you load up on maple sugar, purchased or homemade, here’s what to do with it!